A geo-archaeological examination was carried out in and around the Paharpur area, Badalgacchi upazila of Naogaon District in the north-western part of Bangladesh. 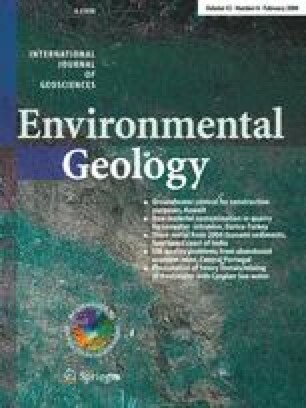 Clay mineralogy and global paleo-temperature curves were used to determine the paleoclimatic and depositional environmental conditions of the Holocene archaeological soils (Barind clay residuum) of the Paharpur archaeological spot. Clay mineralogical data show that the dominant clay mineral is illite with subordinate amounts of kaolinite and chlorite. The high illite and low kaolinite content implies a marine or estuarine deposit. The clay mineral ratio log diagram, constructed by plotting the 7–10°Å integrated intensity ratios versus depth, supports this assumption. The presence of illite, together with quartz and feldspar, suggests high detrital input under generally cool to temperate and dry climates. Chlorite is another common by-product of weathering reactions with low hydrolysis, which is typical for cool to temperate and dry climates. The results suggest the existence of a marine–estuarine influence under a generally cool to temperate and dry climates around Paharpur and the surrounding region throughout the Pala dynasty around mid-century 700 a.d. to early 1100 a.d. Furthermore, this observation is consistent with the global paleo-temperature curves. This work has been performed as part of a PhD work, supported by the Chinese Government Scholarship Program through the China Scholarship Council (CSC), The Peoples’ Republic of China. The authors are deeply grateful for this support and the additional financial support provided by NSFC (grant no. 40525008) for doing fieldwork and some lab. work in Bangladesh. The authors are also indebted to the Foreign Student Office, China University of Geosciences for the logistic support. The authors also gratefully acknowledge the cooperation and support from the respective authorities of Bangladesh National Museum, Department of Archeology, Bangladesh Space, Research and Remote Sensing Organization (SPARRSO) and Department of Geology, University of Dhaka, Bangladesh. Thanks are due to Dr. A.S.M. Maksud Kamal, Associate Professor of Geology Department, Mr. Anwar Zahid, Doctoral Research Fellow and M.A. Al-Masud Khan, Research Fellow, Dhaka University for their encouragement throughout this work. Thanks are also due to the Bangladesh Atomic Energy Commission for providing X-ray diffraction (XRD) laboratory analytical facilities. Last but by no means least, the authors are grateful to the unknown reviewers, the Chief Editor Dr. Philip E. LaMoreaux, Ann McCarley and Nancy Green for their critical reading of the manuscript and helpful comments and feedback on it.